I been actually accomplishing a few small projects lately, which makes me feel very happy and less like that I'm drowning in a sea of nothingness. First thing I did was paint my rusty, chipped mailbox. To be honest, I really should have just replaced the mailbox, but I would have had to figure out how to drill holes into my brick. Seemed easier to just paint the old one....event though it's all rough and chipped underneath. I did do some sanding, but I didn't have the right kind of sandpaper. Finally, I just painted it as is. From a distance, I'm completely fine with it. 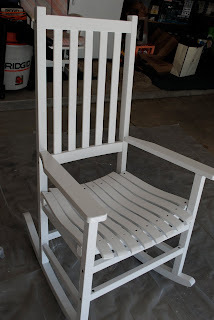 Next on the project list was painting a wood rocking chair that's been sitting on my front deck for several years. 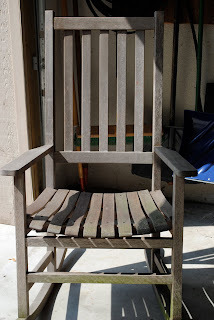 I oil and clean it every year, but it was just too dingy to freshen up anymore. Out came the white paint and here are the before and after shots. I am very happy with how the chair turned out. Once I get all my flowers done on my deck, I'll show you the whole effect. The final project was to dress up the clay pots that I'm using as centerpieces at Mikey's graduation party. I just did a little change, but I think it really gives them a more finished look. I think this is one of your most beautiful posts yet and I want to copy every single one of your projects. By asking us not to click on the mailbox photo, only made me want to do it more. It looked even better enlarged and I want to know how you managed to keep the paint off the brick. Luv the color. 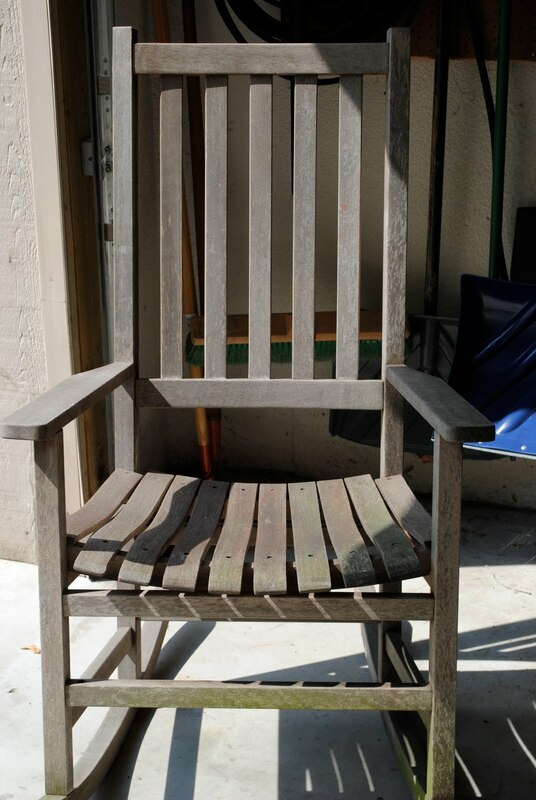 I have a very old antique wicker rocker that would look good with new paint. Are you for hire? The pots -- oh the pots! I'm crazy nuts over that look and the thought of them filled with herbs is perfect. Your party guests will be impressed. Congratulations to Mikey. Thanks for the visit and nice comment! And most of all, for giving me a new blog to check out and follow! Love the pots. wow, you've been busy! These projects look fantastic. I love the mailbox. I'm glad you kept it because it has this vintage sort of look, but really refreshed and clean. Soemthing I bet people will ask where you purchased! 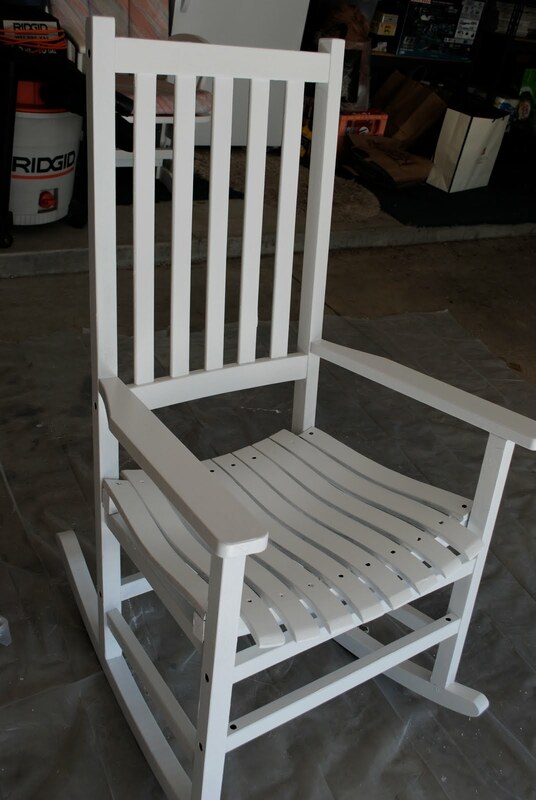 Love love love the rocker. Can you imagine how it'd look if you got a cheap nice cushion from target or world market? Then along with your new flowers?!! Love the pots too!! That strip of white really cleans them up, modernizes them. I bought some chalkboard paint and I think one of the ideas on the box was to paint a strip on a little clay pot. That'd be cute too. Amazing what a little paint will do! It all looks fresh and spanking new all for pennies, I'm sure. Nice job! Nice projects! I had to completely replace our mailbox because it was rusted beyond repair and starting to implode. I love your rocker. I have two of the same that used to be white. I painted them black because the white showed all the dirt. They still get dirty and show the dust but I love them in the black!